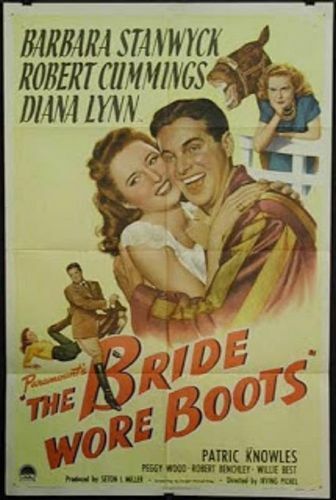 Charmless films like The Bride Wore Boots helped to kill the postwar revival of the "screwball comedy" genre almost before it began. Here's the deal: Breeding-farm owner Sally (Barbara Stanwyck) loves horses. Novelist Jeff (Robert Cummings) hates horses, but loves Sally. Jeff and Sally marry, only to break up over their equestrian differences. They spend the rest of the film trying to get back together again, despite such hurdles as flirtatious Southern belle Mary Lou Medford (Diana Lynn) and charming "other man" Lance Gale (Patric Knowles). Is it any surprise that the film ends with a Big Race, and that horse-hating Jeff is astride the winning steed?